Há por aí muitos presépios minimalistas, esta é a minha versão. Feita com rolhas, no fim de um jantar. Maria é do Minho, José do Dão e Jesus do Douro. Talvez por isso tenha nascido já matulão e com farta cabeleira. There are many minimalist Nativity scenes out there, this is my take. Made with wine corks, after dinner. 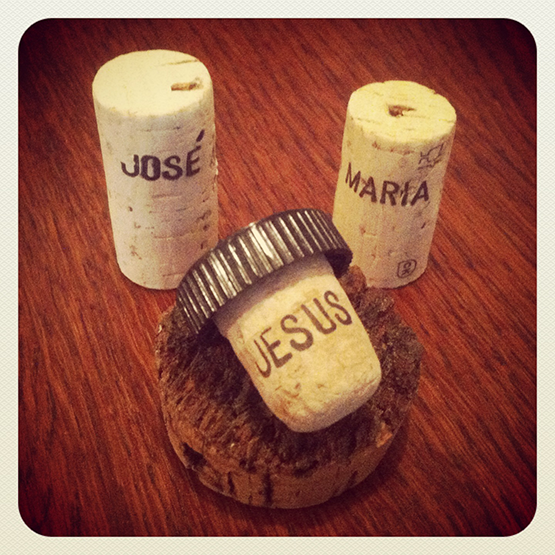 Mary is from Minho, Joseph from Dão and Jesus from Douro. Maybe that’s why he was born already big and hairy. Please, check the links, because each one is a different portuguese wine region. Portugal is the biggest cork producer in the world.